This publisher is certainly very interesting. Can anyone tell me if nested styles are possible (see InDesign)? I would like to know: in paragraph styles how does Alternative typography work? 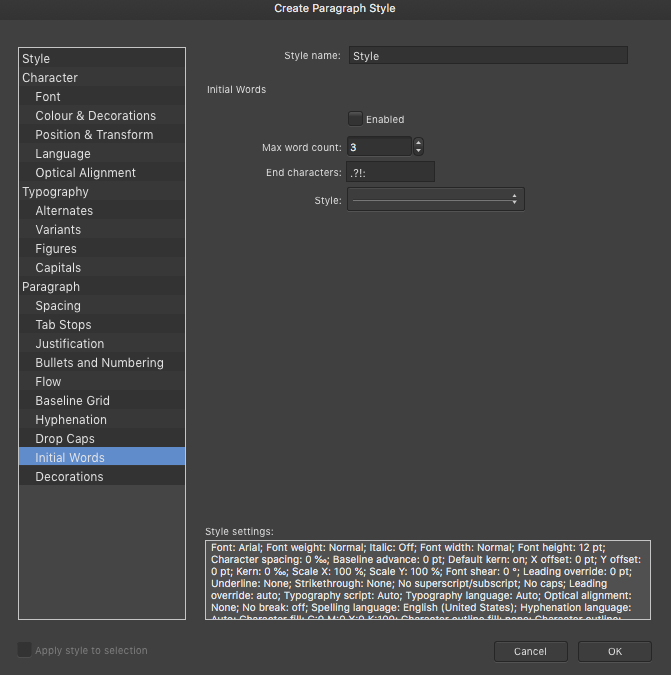 In the Paragraph Style dialog box used to define a paragraph style, there is a panel titled, "Initial Words". (See illustration below.) There you can program a "nested character style" that you've defined to be applied to the first X number of words (or characters up to a termination character), but at the moment Affinity Publisher does not allow for more than one "nested character style" within a paragraph style. I'm hoping that the development team will add the ability to program multiple nested character styles within paragraph styles by official launch. There are certain applications where this would be very useful (e.g., product catalogs, where product photos are captioned with a short paragraph of key attributes: a short description, a color availability, a SKU number, a price, etc.). Applying a single paragraph style with multiple nested character styles would make short work of formatting these repetitive items. Affinity Team, here's my plea for the capability to program multiple nested character styles within a single paragraph style in the "Initial Words" tab of the Paragraphs Style dialog box. Perhaps consider renaming that tab to "Nested Styles".